A petition has been launched calling on EU leaders to scrap plans that would criminalize those who rescue migrants and refugees arriving on the Greek islands as part of a push to secure the border between Turkey and Greece. London-based civil liberties watchdog Statewatch has released the confidential European Commission report detailing the plan, which was outlined in talks between EU ministers in Amsterdam late last month. The proposed plans would remove the exemption for charities, volunteer groups and others who provide “humanitarian assistance” to refugees from being considered “smugglers.” Under the new rules, which are aimed at reducing human smuggling and trafficking, these groups and individuals would be criminalized. The EU would instead create a state-run agency that would force would-be volunteers to register with the police and work under tightly controlled EU relief plans. The petition, which has amassed almost 5,000 signatures to date, was launched by an activist in London and calls on the European Commission to scrap the plans. Statewatch director Tony Bunyan says the plan “fails to acknowledge the crucial role played by Greek islanders and volunteers in rescuing and caring for migrants who cross the Mediterranean in unsafe vessels. 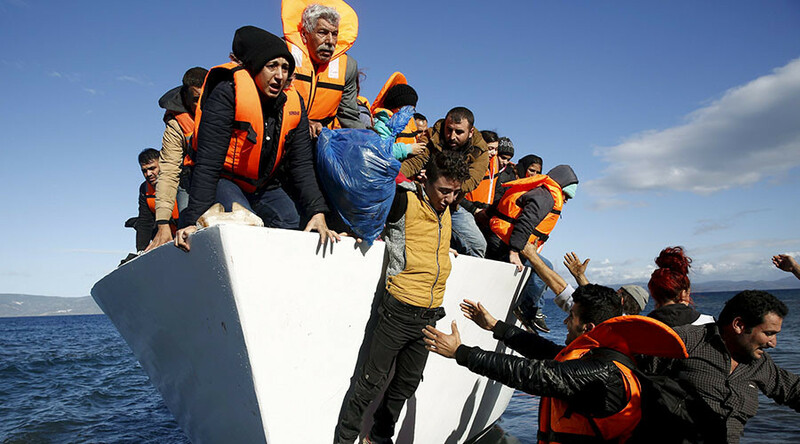 In January alone, at least 244 refugees drowned trying to cross the Aegean Sea. This figure is three times higher than the 82 who died last January and 20 times higher than the 12 who died in 2014. According to the International Organization for Migration (IOM), nearly 37,000 migrants have arrived in Italy and Greece by sea since the beginning of last year.